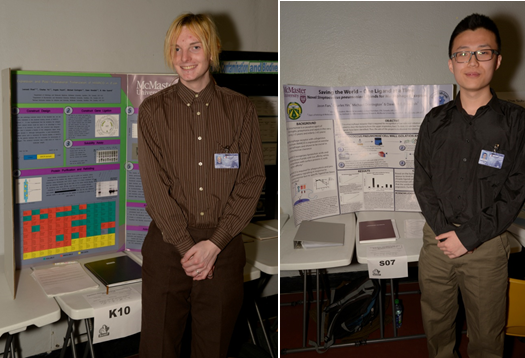 Bowdish Lab Cleans Up at the 53rd Annual Bay Area Science and Engineering Fair (BASEF)! On Thursday May 21st, Bowdish Lab members were not only working hard as judges at the 53rd Annual BASEF fair, but also actively participating in presenting our research. Our high school students Jason Fan, winner of the IIDR summer studentship in 2012, and Leonard Rivet, a high school co-op student, both created fantastic posters and engaged judges in discussing their projects. Jason Fan (Right) received a Gold Merit Award and $100 for his poster entitled “Saving the World — One Ligand at a Time: Novel Streptococcus pneumoniae Ligands for Macrophage Receptors”. Leonard Rivet (Left) received a Silver Merit Award and $80 for his poster entitled “Expression and Post-Translational Trimerization of MARCO in E.coli”. Bowdish lab members Leonard Rivet & Jason Fan present their award winning posters at BASEF 2013. Jason went on to win a silver award at the Canada wide Science Fair and to be accepted to McMaster’s prestigious Bachelor of Health Sciences program. Congratulations to both our fantastic young scientists! This entry was posted in News and tagged award, BASEF, IIDR, poster, success!, summer student by Dr. Dawn M. E. Bowdish. Bookmark the permalink. Publication: Is Lung Health Good Health For Older Adults? Bowdish lab undergraduates present their work and bring home gold and silver awards! November is Lung Month – what do older adults need to know about pneumonia?